Talbot Suites at Stonebridge features 73 luxury apartments ideal for luxury family breaks in the heart of Wexford Town. Guests will have direct access to complimentary private secure parking and complimentary access to the Talbot Quay Leisure Centre. Guests will also have full access to food and beverage services at the Talbot Hotel, located less than 100 metres away. 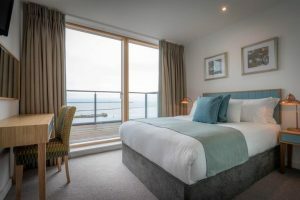 Talbot Suites at Stonebridge features a mixture of one, two and three bedroom apartments over 5 floors with a choice of seaviews or courtyard views. 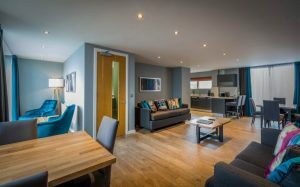 Each apartment is finished to the highest standard with floor to ceiling windows, a high-gloss Kitchen fully equipped with Oven, Microwave, Coffee Machine, Dishwasher, Fridge Freezer, TVs in all bedrooms and living area, Gas Central Heating, Washing Machine and Dryer, FREE Wifi and own patio or balcony. The apartment is fully secure and has stunning views of the River Slaney, Raven Point, Ballast Bank, Wexford Town and Mount Leinster. There are many castles, trails and attractions as well as shops, restaurants and golf courses in close proximity to the apartments.